Though age and experience can make it a little easier to let go and move forward, completely letting go and allowing ourselves to heal and look to the future with optimism and excitement can be difficult to achieve. We've all had to let go of things at some point or another. Whether it be a pet, friend, boyfriend, or simply graduating high school. We are constantly ending chapters in order to start new chapters. Though age and experience can make it a little easier to let go and move forward, completely letting go and allowing ourselves to heal and look to the future with optimism and excitement can be difficult to achieve. Our tendency can be to focus on "what used to be" and idealistically hold on to the past as if it had everything we ever wanted. #1 -- Pay tribute. We can do this in a number of different ways depending on your own personal preference. You can write down your thoughts and feelings about this in a journal. If you are trying to let go of a person (either with a breakup or the person's passing), you can write them a letter sharing all the things that you valued about the relationship and then you can either send it or keep it for yourself. If the person or pet has passed, you could create a little ritual out of it by leaving the letter in a place that reminds you of that person. If you're not much into writing, you could also create a photo album or scrapbook to help yourself continue to cherish those memories. This can be a nice way to "organize our pieces of the past" into one activity. #2 -- Cry when you need to. Know that it's okay to grieve. If a thought or memory comes up when you're grocery shopping then let it out. If it happens in the shower, then let it out. Don't try to hold it in or force yourself to cry cause you think you should. Just let it happen naturally. 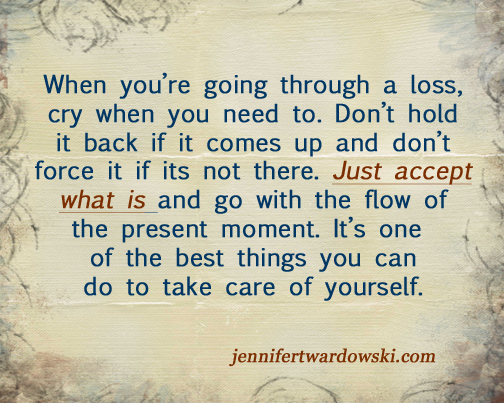 Your body and soul knows when it needs to grieve... trust that it will come up when it needs to. And allow it to come out when you feel it come up rather than whether it is "socially appropriate." Focus on what you need rather than whether it will "make other people uncomfortable." Take care of yourself -- be your own emotionally nurturing mother in this way. #3 -- Focus on what you need -- not what others think "you need." Don't push yourself to go bowling just because someone told you you need to. Don't listen to what other people "think you need" but rather listen to what you KNOW you need. If you feel that you just need a night to watch movies by yourself or with a close friend then do that. If you feel up for going out and being in a large group then do that. But don't do it just because someone else told you you should. Do it because you really feel that you need it right now rather than because others told you to. That being said, if you feel that others are pushing you to do something or if they are making you feel like a "victim" more than giving you the support you need, then kindly tell them to back off. Remember that it's okay to say something like, "I know you're trying to help because you care about me, but I really need _________ right now instead." #4 -- Focus on what you are gaining. When one door closes another door opens. Whether it be the end of a relationship, job, or the unfortunate passing of someone close to you, there is always another door that opens. Focus on the opportunities that you have. Ask yourself: What can I know create for myself in my relationships or career? Where can I move? What can I do that I haven't done before? Focus on the possibilities. Dream big. Start to write yourself a bucket list or vision board and begin to make plans to make that a reality. Ultimately, remember that tomorrow is another day. Life is a journey and even though one day may be very difficult for you, know that with each new day brings the opportunity for a completely new experience. Start each new day fresh and looking forward to all the new opportunities. Remember: If it is the end of a relationship or the passing of someone close to you, chances are there will always be a small part of you deep within your soul that will always grieve because you miss them. This is okay! The trick here is to not focus so heavily on it that it drags you down. Give yourself space to cry when it comes up but after you let it all out then go back to focus on the present and creating the life of your dreams. After you let it out, do something that you love to do -- dance, play music, go for a run, do crafts, write... simply, enjoy life! What do you need today to help yourself "let go" of something you've lost or something that has ended? Share your thoughts in the comments below! Jennifer is a self and relationship coach and the founder of JenniferTwardowski.com. She helps women worldwide create fulfilling relationships with both themselves and others so they can live happy and joyful lives. Click here for her Free Self and Relationship Healing Meditation and weekly blog updates. To learn about how you can work with her, click here. Connect with her on Facebook, Twitter, and Instagram!